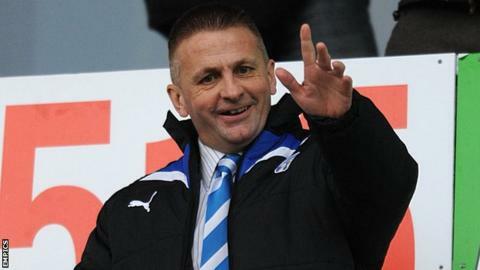 Colchester United chairman Robbie Cowling says he has no "sack the manager pills" in his cabinet, after receiving letters from fans asking him to dismiss boss Tony Humes. Humes's League One side are yet to win a match in all competitions this term. Cowling does not feel sacking managers regularly is a viable strategy. "I find it somewhat offensive when I receive a letter from a supporter of our club asking me to sack the manager," said Cowling in a statement. "I have received such letters for every one of my managers to date and they usually follow the same pattern, where their first request is that I grow a pair and then use my new-found courage to dismiss someone from their job. "And after just a few league games this season, two chairmen in League One have courageously (according to some of our fans) sacked their managers. Knowing these chairmen, I doubt either of them felt they were being courageous but just felt they were doing the best thing for their clubs." Humes, 49, saw Colchester avoid relegation to League Two on the final day last season with a victory over eventually promoted Preston North End. The former head of youth has used a policy of bringing through youth players, including Macauley Bonne, Dion Sembie-Ferris and Sammie Szmodics. They currently find themselves second from bottom of the third tier, but Cowling says there are positives surrounding the club that are not publicised enough. "A quick health check will show that the club is in a relatively healthy state considering its physique," said Cowling, who has had six permanent managers since becoming chairman in 2007. "At first-team level, it is one of a few clubs who are competing in League One with an average home gate of around 4,000 whilst playing attractive football with a very young squad that contains a high number of home grown players. "At academy level, and despite so many of the under-21s being in the first-team squad, the under-21s are currently top of their league. The under-18s, despite so many of their players playing up in the under-21s, have won their last three games on the trot and below that, the club has a Category Two academy that is as good, if not better, than anyone else's. "I very much doubt that the first team would do any better if I had a 'sack the manager' mentality but I know for certain that we could not have gone from having one of the worst youth set ups to one of the best in such a short time without our holistic approach."